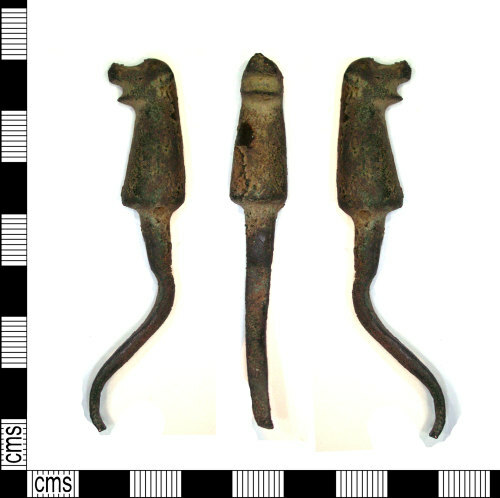 Medieval copper alloy harness hook, 66mm long, 11mm wide and thick and weighing 19.78grams. The object consists of a circular cross-sectioned 'conical' terminal which has a zoomorphic head, suggestive of a dog. Protruding from the base of the terminal is a circular cross-sectioned shaft which tapers slightly in width and becomes flatter. This has a slight bend to it, other examples found have the shaft formed into a hook. A similar example, with gilding was found in Gilmorton, Leics. see LEIC-B07231.